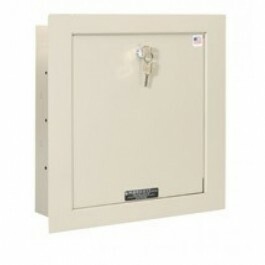 Perma-Vault in-wall safes are designed to fit between standard wall studs for easy installation. The EW-1000-8 in-wall safe is a great solution for home, apartments, offices, hotels, motels, hospitals, nursing homes and dormitories. This comes standard with a key lock. If you want the same wall safe with a Medeco High Security Key Lock please see the WS-100-8-M. If you want the same wall safe, not with a key lock, but with a Simplex mechanical push button lock, see the WS-200-8. Great compact storage and easy to conceal. 15-3/4" x 15-3/4" x 8"